WILLEMSTAD – Will the Netherlands take over in Curaçao or not? 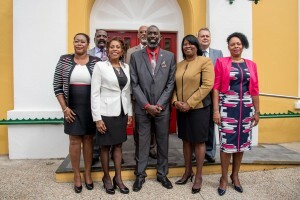 That was the question this morning as the Kingdom Council of Minister met in The Hague to discuss the free elections in Curaçao on April 28 this year. For days the interim government headed by Prime Minister Gilmar Pisas has been sabotaging the elections. The higher supervision by The Hague is unique in the relationship between the Netherlands and Curaçao. Never before has the Kingdom Council of Ministers intervened to ensure free elections in the Kingdom. As it happens, the Council will transfer all responsibilities for the election to Governor Lucille George-Wout. Pisas government will then be put aside. Yesterday the interim government did a final attempt to avoid the humiliation of a higher supervision. The coalition of former Prime Minister Gerrit Schotte, who was convicted for corruption, bribery and forgery, adopted a motion with the message that they no longer stand in the way of the elections. If the higher supervision comes, then, according to Schotte, the blame will be placed on the ‘puppets’ of the Netherlands on the island. Since the inauguration of the interim government just a week ago, Premier Pisas has been trying to postpone or cancel the elections. The group of twelve headed by the convicted former Prime Minister filed a lawsuit before the European Court of Human Rights which did not succeed. The group, through the Minister of Government Services, Norberto Ribeiro, even threatened the members of the Supreme Electoral Council. Only when Governor George-Wout clearly indicated that she will not cancel the elections or sign any national decree that postpones or cancels the election, then Prime Minister Pisas and the group of twelve conceded. That was not enough for the Netherlands.